While I remember to post the Ornie SAL post on Wednesday I clear forgot that it was also WIPocalypse day! 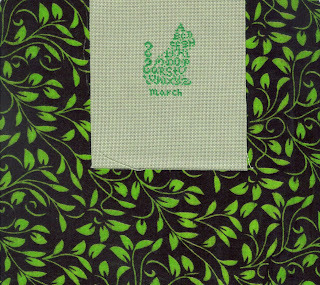 I stitched on two of my 13 projects, Prairie Moon "Thine is the Trick and the Treat" (for one evening only) and also one of the Lizzie*Kate designs sent to me by Sarah. 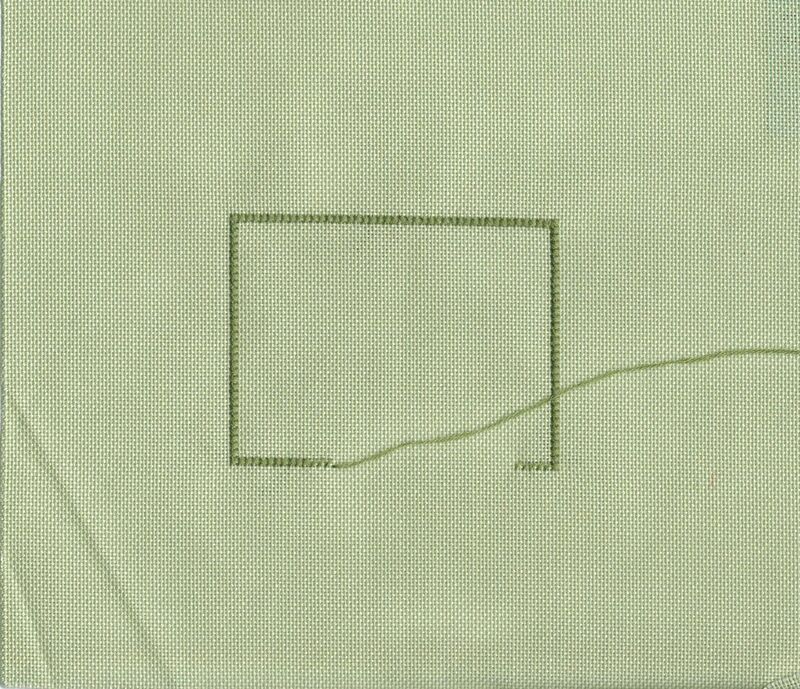 Stitched on 40 count linen 2 over 2. Last night I stitched the N, a star and the skull on the bottom right. From left is the L*K chart sent to me in a giveaway from Sarah, in the centre is the Twisted Threads design sent to me by Kath to celebrate her 30th Anniversary and on the right is the San Man design, also sent by Kath. 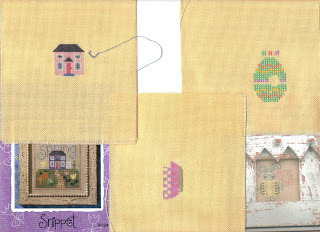 All three are stitched on pieces of the yellow evenweave Kath included in her parcel. Thanks ladies! I've changed the colours of the the pieces to tone with the fabric and each other. The Chatelaine Bunny is no longer available. Martine emailed Vickie to say it was a limited time frame only. Maybe if enough of you email her she might re-issue it! There are more freebies on her website. So that will be my evening stitching as during the day I only stitch smalls. I have Julie and Sophia's RRs to finish then I'd like to continue with Green Goddess. The second round of the Large Mira will be appearing towards the end of the month so I can stitch on that one too. Finally, the Easter Treasure Hunt Blog Hop is open until 8th April (see previous post). Lots of correct answers so far but time for more to enter. Enjoy the rest of your Easter Holiday. Welcome to the 2013 Easter Treasure Hunt Blog Hop. All you have to do is visit each of these blogs in order, note down the letter above the Easter / Spring themed pic and remember the short phrase they make up. Come back here after the last letter and leave a comment saying what the phrase is. I will select one person at random to win a small stitched prize. I will also randomly select one of the Picture Posters to win a stitched prize too. Comment moderation has been turned on for the duration of this competition which closes on the 8th April, my Blogaversary and also the Birthday of at least two of my favourite Followers! How do you fit a quart into a pint pot? Fortunately, the Large Boy was on hand to solve the problem - eat them! Sorry Christine, I hope your girls have left you some of the survivors! The design is a freebie from Chatelaine Designs, Yes I have finally stitched my first Chatelaine! Not quite one of the Mandalas but a good start nevertheless. Finally, have a Great Easter break, enjoy the competition and Good Luck to you all. 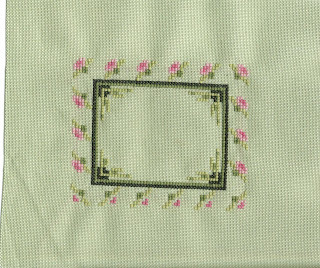 I've posted this one before, but I've found the backing fabric now. It was in my paper craft bag. Obviously! 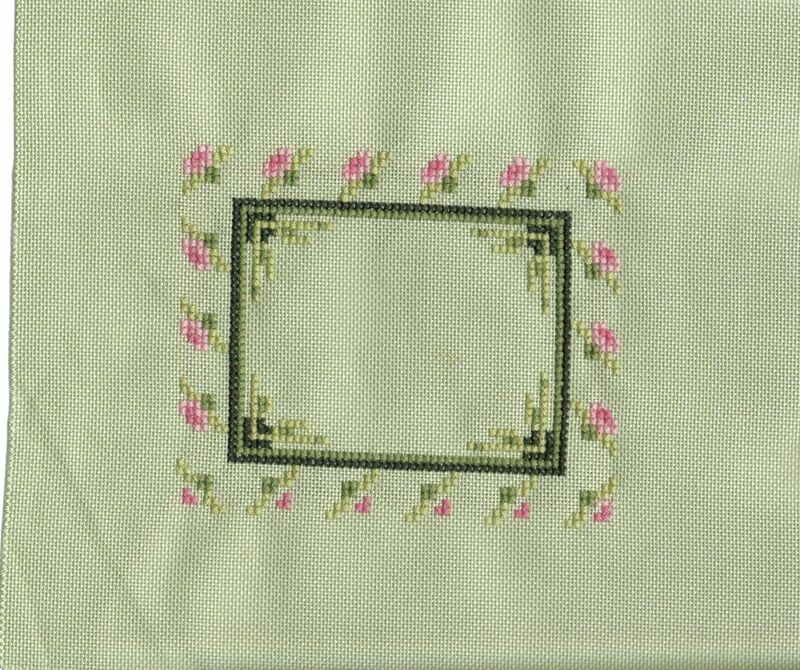 I have a little shamrock charm and I'll stitch it up this weekend. For some reason Sundays feel like finishing days! The design is the JBW cat from Just Cross Stitch Hallowe'en special 2012 but stitched in colours for March. I'm planning in stitching one a month in appropriate colours. 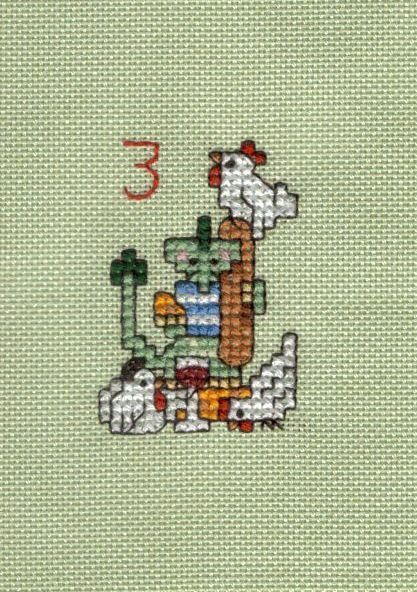 Next is the Third Dragon Day of Christmas. This is a series from Dragon Dreams available only on Facebook. 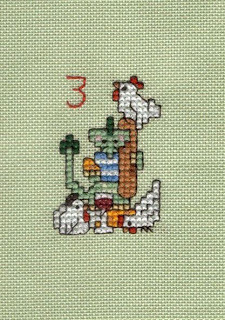 This is Three French Hens including a little French Dragon wearing a Breton top, holding a baguette, some cheese and sporting a suave leetle French moustache. My son noticed the 'tache, I didn't. This week I've been stitching alot of smaller projects, I seem to get more daytime stitching time rather than evening thanks to the Small Boy's schedule and sleep patterns. This is my progress on March's piece for the Hallowe'en Ornie SAL. It's a freebie from La Contesse, from last October. 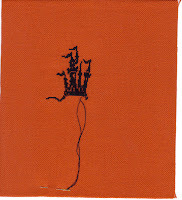 Once again I'm using my favourite burnt orange 28 count and stitching over 1 with Anchor black. There isn't anything to choose between Anchor and DMC Blacks are far as I can see so once this skein is used up I'll stick to DMC. This is my main man Michael! 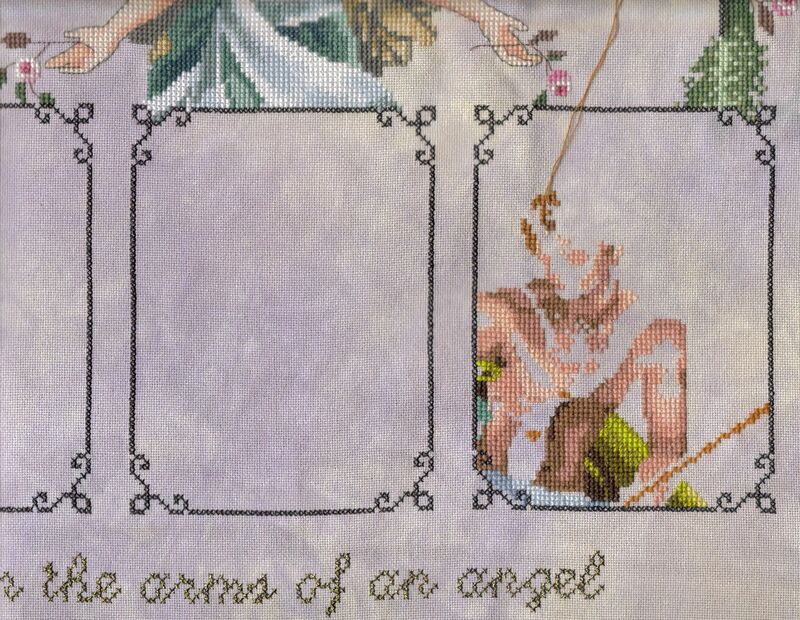 I'm stitching the Archangel Michael for Julie's Mirabilia Round Robin. 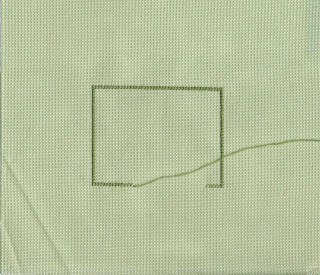 I'm really pleased with this photo, it looks better than in real life, maybe I'm too close to it when I'm stitching? I did have a slight moment late last night. As you can see I've done all the darker skin shades. The key shows the next symbol as being 946. This is a very bright orange! Now unless he's from Essex, that's clearly not right! So I popped onto FB and the Mira Minions page to ask for help. In less than 10 minutes I had my answer, 948 not 6. Isn't t'internet great?! And the five minutes of Fame? 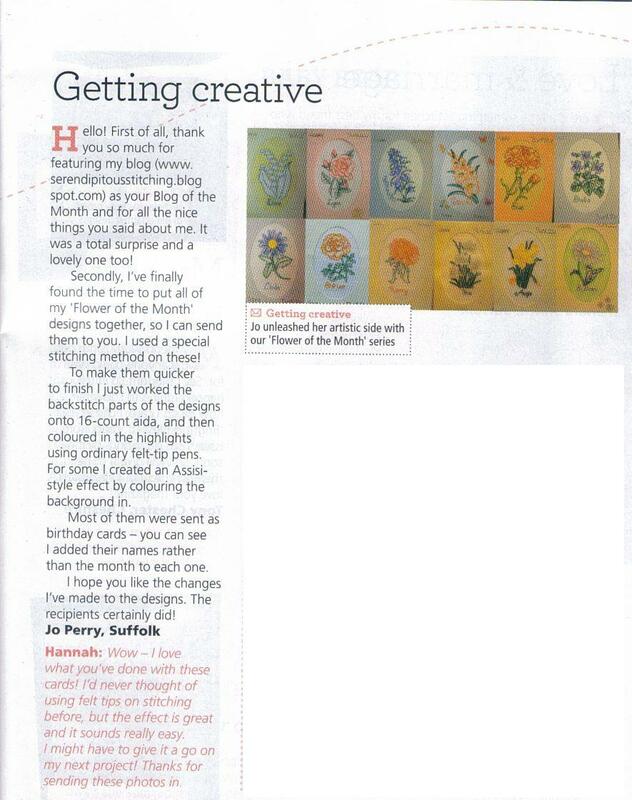 I'm featured in World of Cross Stitching again, the Letters page this time with my Flower of the Year cards. 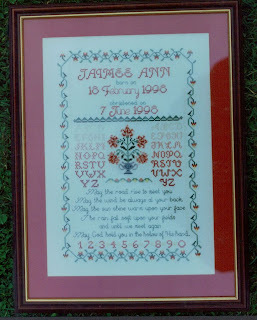 You may remember I stitched this last year for various Birthdays using my patented method of backstitching on aida then colouring in the design using felt tip pens. Someone always asks about the pens, they are just standard children's felt tips nothing special or expensive! Here's a better picture of all twelve designs in month order. ps I haven't patented that method of stitching, it just sounds good! Finally, my Easter Treasure Hunt Blog Hop will be taking place on Good Friday. Come over and follow the list of blogs, find the letters and spell out the Mystery Phrase. There will be two prizes, one for a Picture Poster and one for a Treasure Hunter, nothing very exciting, some seasonal stitching and a few bits, maybe something edible! 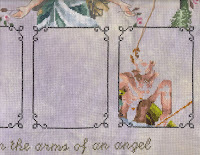 Since everyone made so many nice comments about Danika's Birth Sampler I thought I'd share a few more I have stitched over the years. 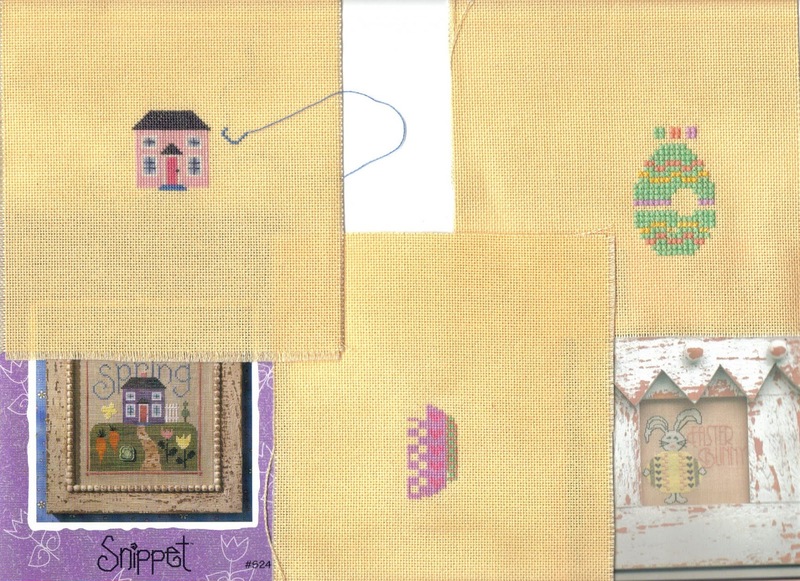 Birth Samplers are probably my favourite thing to stitch. It's always a happy occasion and there is such a variety of choice and styles as this selection will illustrate! 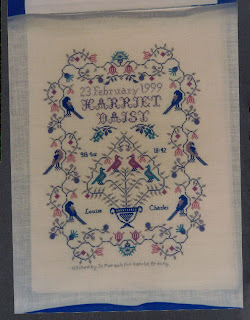 This first design is actually a Christening sampler stitched for my friend's God-Daughter. I designed this myself using motifs, alphabets and borders for a variety of books. The first is a traditional Irish Blessing which we felt was appropriate because both families are farmers and it talks about fields! This next one is for the same friend but for her own daughter. The design is from a Brenda Keyes book. This one is for another friend who worked with me and the first friend. 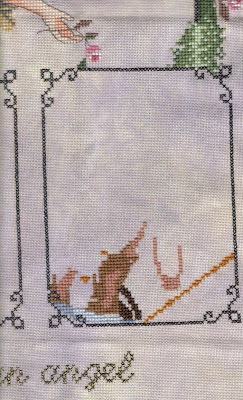 I stitched it for her daughter. Notice anything about the two dates of birth? They are the same! Two really good friends fall pregnant at the same time and give birth on the same day a few hours apart! And a third friend, a month later! 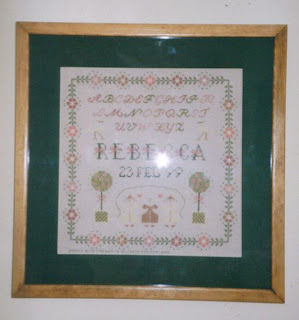 I stitched this one during the pregnancy and had it ready and waiting to add baby's name and date. 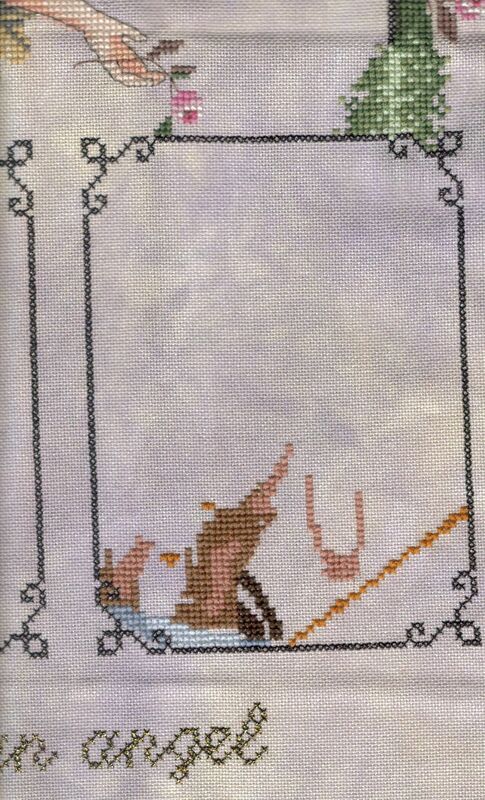 The design came from a cross stitch magazine. Then a little break and a sampler for my own son. 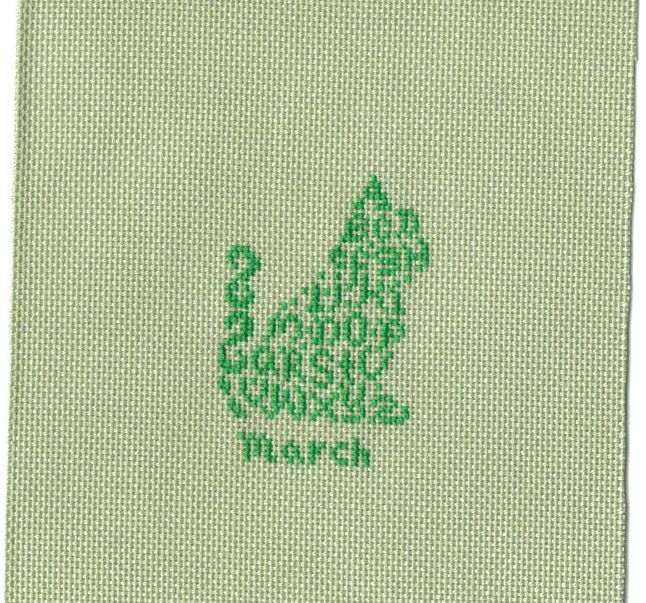 Again I stitched this one during the pregnancy and added the name and date afterwards. This came from a Library book. This is a little Emily Peacock design from Cross Stitcher magazine. My cousin is not really a sampler kind of person, but she is a tattoo sort of person so this was perfect. RJ are baby's initials, he's named after his Dad so they call him RJ to tell them apart. Another one for a baby I don't know! A friend of a friend had a very premature baby as you can see from the weight and length. My friend was making her a basket of hand-made goodies and asked for a cross stitch. I charted the bear and other little characters from the Nursery theme they were using, Mothercare's Please Look After Me bear. And for Noah - Noah's Ark. Most of this came from a cross stitch book but the picture for N was a Nautilus shell. what? So I charted a little Noah from this little Noah figure. Cute isn't he? 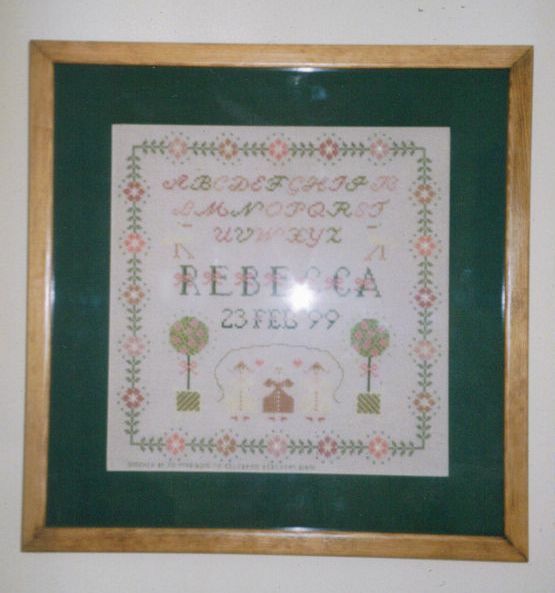 And history repeats itself, the friend that I stitched Jacob's sampler for then had another baby herself. I knew she'd love this Nimue design as much as I did. 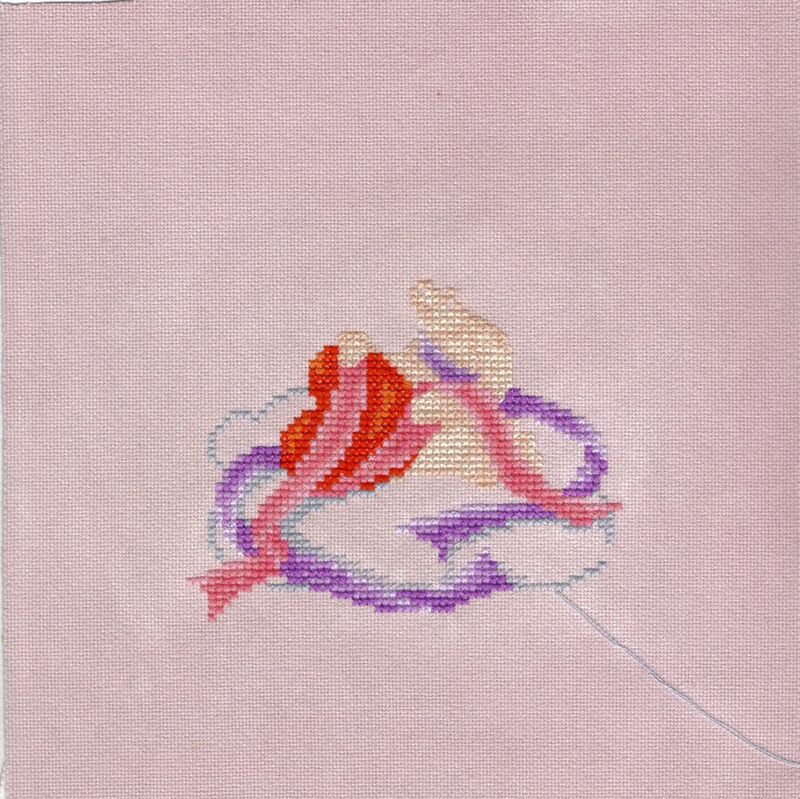 This was a real labour of love, the backstitch was very difficult to follow and don't even ask about those lianas! But I did enjoy seeing this cute deign grow. 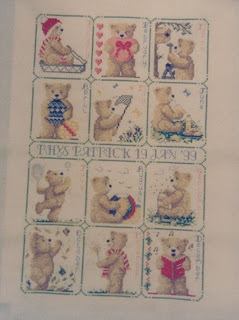 Onto 2012 - This one came from Cross Stitcher magazine too. I moved the letters around to add the baby's name and that of his Big Sister too. I'm really pleased with the way the wonky lowercase letters I added fit in with the rest of the alphabet. My other cousin had a baby last year, here is the JBW design I chose for them. A simple red on flax evenweave stitched one over one. Finally, you might have spotted that there isn't a sampler for the Small Boy! I was convinced he was going to be a girl so started stitching the Victorian Dolls' House for her. I intended to stitch a castle for him but somehow never got around to it! Bad Mummy. Maybe I'll wait until he's old enough to choose his own design. 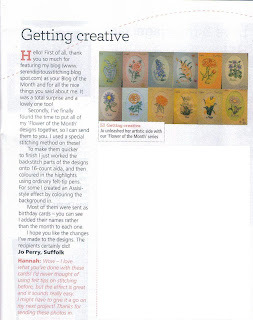 I have to be honest, I'm not into the whole "stitch a different thing every day " lark, I'm more of a OAAT gal. But for Heather I have to make an effort, especially as February didn't figure too well! The Dragonlets are a Facebook exclusive series from Dragon Dreams and are just so cute! Not sure about that dark tan colour but it is the one in the key. So 6 projects in 15 days. 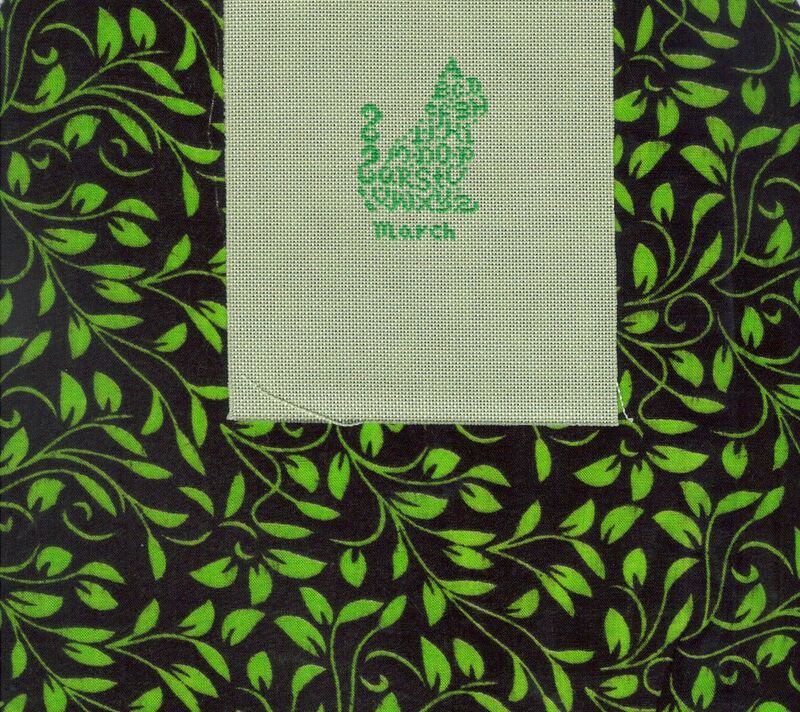 I'm aiming for 13 projects in the 31 days of March. Of course the big news of this week is the recent announcement that Google Reader is disappearing as of 1st July 2013 due to it being "little used" according to Google. Well apparently every blogger and stitcher does actually use it and is rather concerned! There are a number of alternatives including Bloglovin' that several people have signed up with already and also Feedly. I've had a very quick look at both and Bloglovin' seemed to be the most newbie-user-friendly of the two. I'm going to wait and see if Google do a u-turn before spending too much time changing. One question, can you follow any blogs on Bloglovin' or just those blogs signed up for it? There is also a petition to try get Google to change their minds, click here for the link. Finally, it's a short post because we are in the process of changing our internet provider and the very day after we requested the transfer code our modem mysteriously stopped working! So we have a dongle with a small amount of credit and limited time allowed. Ah, modern technology at it's best! Look, there's more of that lovely green fabric! The three pictures are the L*K Travelling that is still doing the rounds, a freebie rose from a newsletter somewhere and Just Nan's Dewdrop Bunny. There's one spot left for me to fill. The lovely if slightly crazy Karen is celebrating her first century, yes she's 100 years old and still belly dances, an example to us all. 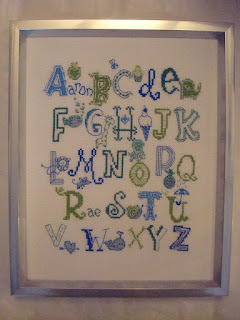 If you'd like to win a piece of mad fabric then ramble over to her blog and join in. (You can't have the sane fabrics, I want them!) - Old Girl Stitching and Rambling on about Young Men like a lovely doddery old lady from Harry Enfield. I think that's what the blog is called anyway. Don't tell her I sent you, she'll kill me if she reads this hahahaha. Finally, don't forget I'll be hosting the Easter Treasure Hunt Blog Hop on Good Friday. You can join in by being a Picture Poster (email me if you'd like to do that) or you can just hop around the blogs and find the Mystery Phrase (no blog necessary for that option). Danika is my friend's new grand-daughter. The little characters are from the Mamas and Papas Millie and Boris nursery range that the new parents have chosen for their daughter. The frame co-ordinates with the white gloss in the room. 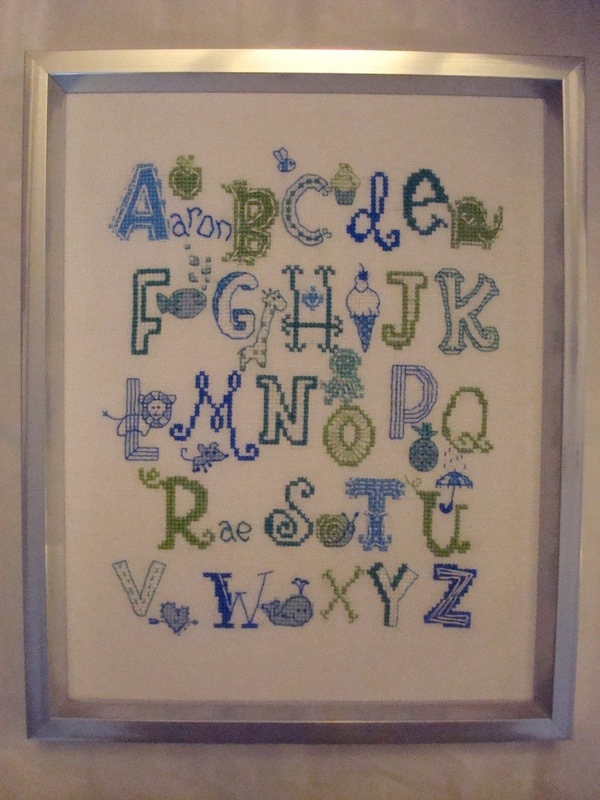 I charted the characters from some images I downloaded from the M&P website and found a lovely Slavic font through Google Images which I also converted to cross stitch. The buttons are Just Buttons and probably cost more than the rest of the project put together!! In return for stitching it I got some pennies and an Easter Egg. Hopefully I'll get a nice picture of baby too. I have spent the money on some new stash already! 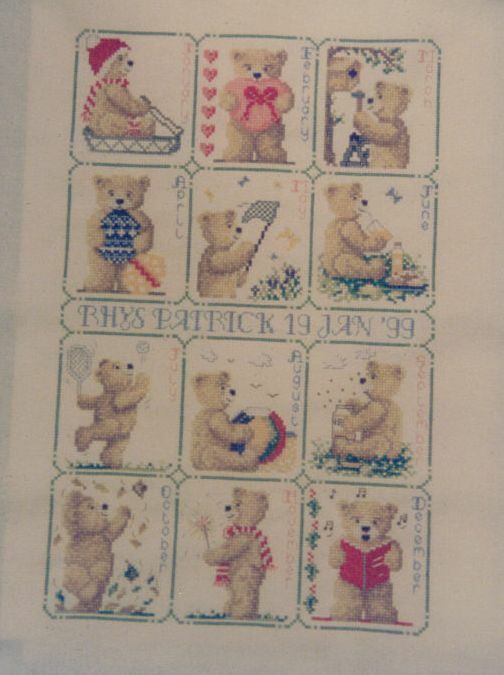 There is a woman on FB destashing 25 years worth of stuff! I bought some Just Nans. 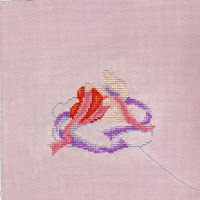 If you're interest in Drawn Thread, Sweetheart Tree, LHN or Lizzie*Kate in particular then ask for an invite so you can browse (it's a closed group so you can't see until you join). This is a very old finish I needed to photograph for my Happy Dance blog. Stitched back in 1994 or 95 on black aida, it's a row of cute kitties that sat on my son's window sill for several years. The first picture is how it looks and the second shows the difference between the front and the back! 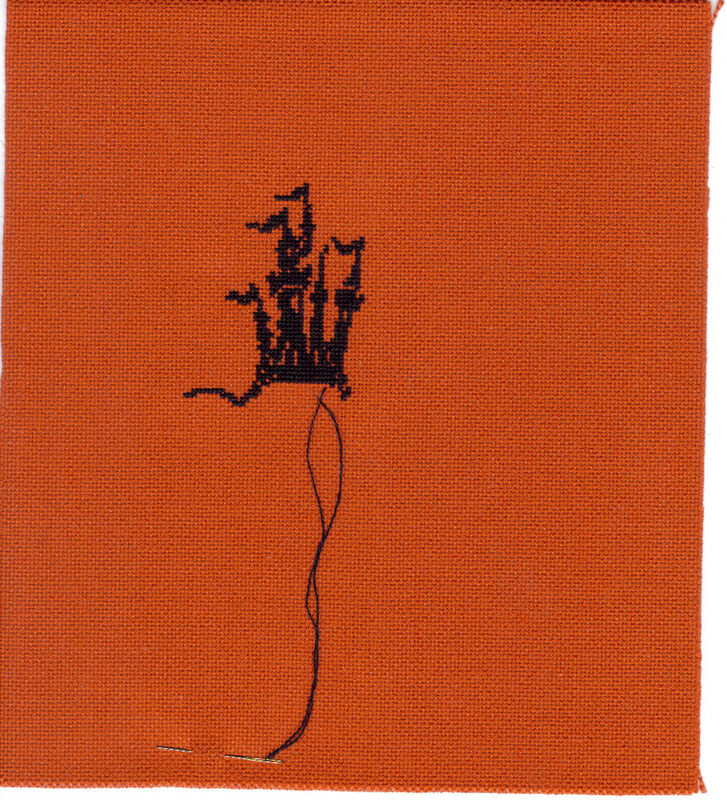 Here's a nice new blog just launched with a week of freebies - The Snowflower Diaries. 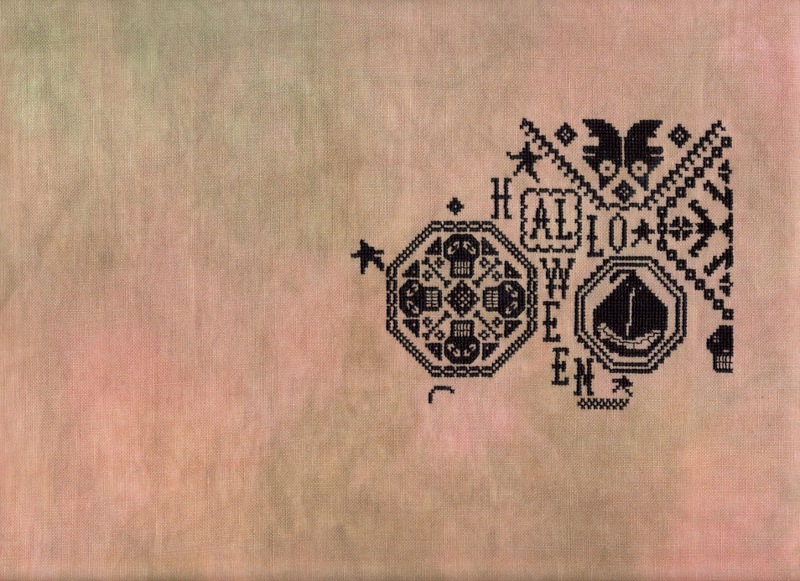 Maja is a Hungarian participant on the Hallowe'en Ornie SAL and one of the first designs is a Hallowe'en chart. The other one is some rather more seasonal bunnies. Talking of Hungarians and bunny freebies - here's another link - Palko-lap. There are lots of different freebies here as well as these Quaker Bunnies. The Quaker Cat is a favourite of mine too. Finally, it's Mother's Day in the UK tomorrow so hopefully you'll all be getting breakfast in bed and lots of nice treats from your children and/or furbabies. If you don't have children or furbabies then you can have a lie-in any time without being suddenly woken up at unsociable hours by unearthly yowling so you don't need a special day! If your country doesn't celebrate Mother's Day in March then you must claim your English roots and tell your family you need to be treated, make them do it in an English accent too, just for fun. Funny how sometimes you just seem to use the same fabric over and over without intending to! This is some 28 count Jobelan that I seem to be using alot. 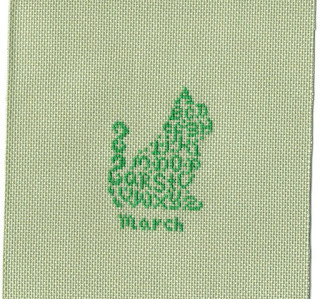 I'm stitching the 12 Dragonlets on it and also March's JBW Alphabet Cat. Then I picked up a freebie Easter design and thought "that'll look good on green". I would show you the backing fabric I'm going to use but I can't find it! I acquired three scraps of fabric when I sorted out the Preschool bag of offcuts, two of which would be perfect. If only I could remember the safe place I put them in! I can't really show you this one much more because it's a present for someone. Don't think they'll guess it from this picture though! Not much other stitching going on at the moment. Small Boy has decided 6am is a good time to start the day so I'm going to bed earlier to make up for the early start. Large Boy is a 7.30 riser which is much better for me! 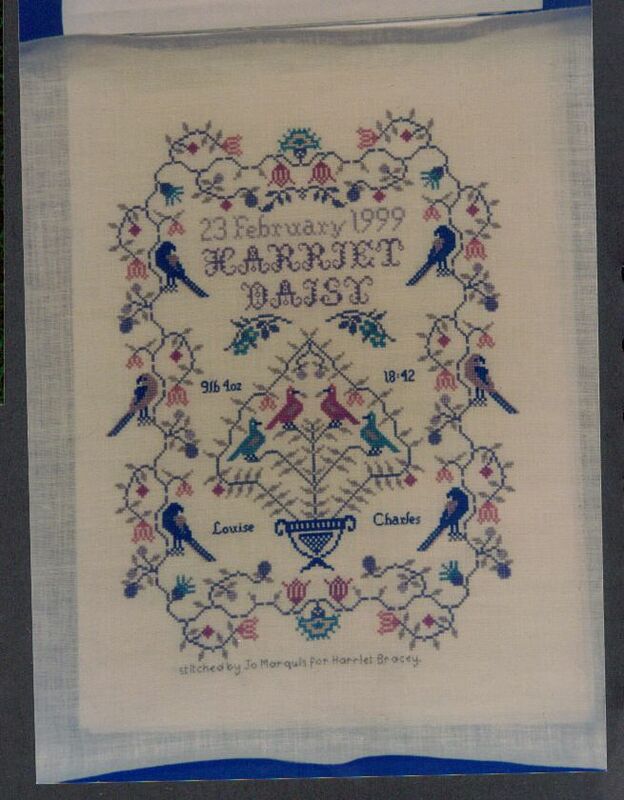 I have finished the Birth Sampler and the buttons arrived this afternoon so I'll be attaching them tonight. My friend should bring the frame to Preschool tomorrow then I can frame it and give it back to her for Friday to present to the baby's parents at the weekend. Hope they like it! Finally, I have decided that the Easter Treasure Hunt Blog Hop will take place on Good Friday rather than Easter Sunday. Sunday is the 31st and I'll have a big Theme-a-licious post to make, I'd like the blog hop to have it's own post. There is still time to join in, just leave a comment or email me if you're a "no reply" person. I will allocate you a letter of the alphabet which will help spell out the mystery phrase. 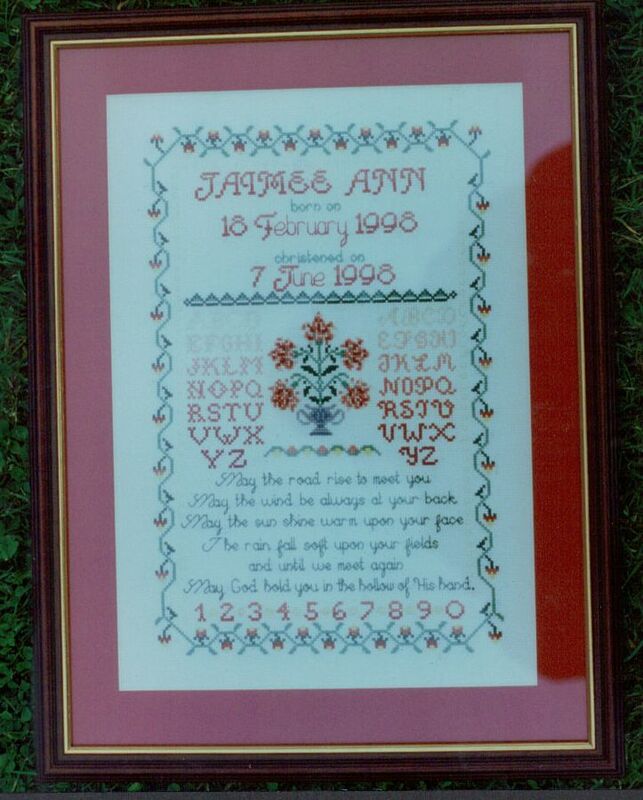 On Good Friday you post a stitched picture on a Spring or Easter theme along with your letter. I list all the blogs involved and everyone hops round like an Easter Bunny to find the mystery phrase. There will be prizes, including some of these cute buttons I bought from a patchwork shop, for only 15p each! The Bunny ones will be for the blog hop and the flowers for a certain event happening on the 8th April. They had some heart ones and some bigger round ones too. They also had squares of fabric for patchwork/ornie backing for £10 for about 40 or 50 5inch squares. Is that a good price or too much? They were lovely themed fabrics but I'm not sure I'd make that many ornies in a similar colour scheme!